Microsoft’s latest Operating System Windows 10 is going to be launched on July 29th and many of from us are awaiting to work on it. Hundreds of articles and thousands of shares reveals that Windows 10 has packed up with bunch of new features. Even the features which are considered a minus in the recent editing have now received updates and ready to excite the users. Like everything noted to be Windows 10, it is one of the features which has been borrowed from Windows Phone and it is Wi-Fi Sense. A Networking Feature Wi-Fi Sense which lets users to enjoy Wi-Fi access with the credentials along with the friends and surrounding to the users. 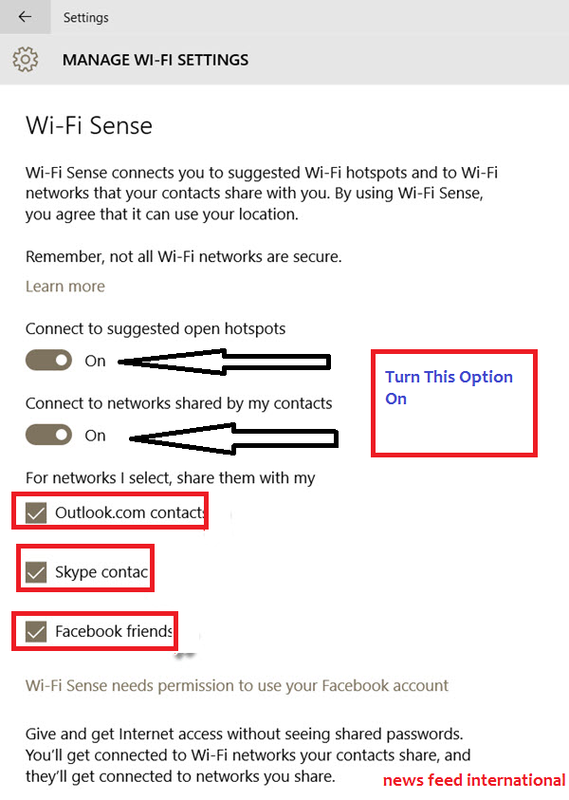 In this aspect Wi-Fi Sense shares Wifi username and passwords with the friends who are present in users facebook and Outlook. With this feature, many firms are raising their tone on Windows 10 as it is a serious security concern of the users where all Facebook friends are not good and all the emails shared or connected to Outlook are not in really exists. However to this question, Microsoft has replied that Passwords are shared with the friends is done all by encrypted network and also quoted that the password is also encrypted. Further stated that a device which connected to an network doesn’t interact with other connected PC’s nor exchanges anything. Apart from that one more major concern is that Wi-Fi Sense connects directly to an crowd-sources open networks of Wi-Fi and as of the security concerns users are requested to not automatically connect to an Wi-Fi Network which is open. It is here to be noted that in Windows 10, Wi-Fi Sense is enabled by default but users can disable it with a simple change in the Network & Internet options which is available in Settings. Users can disable Wi-Fi password sharing of a specific network through router settings all the way. . If Users intended to not share their home network password in Windows 10 then one could do this with the router settings which is fast and easy to set. Go to Router’s configuration Page which is found at http://192.168.0.1 or http://192.168.1.1 and add a supplement “_optout” at the tail-tag of once Wi-Fi Networks’s Name aka SSID. Take Example :- If Network’s SSID is newsfeed change it to newsfeed_optout.